JACKSONVILLE, Fla. (AP) — Even if the memory is still fresh, the temptation is there for Pittsburgh to overlook the Jacksonville Jaguars. The Steelers might have been guilty of that in January in the AFC divisional playoffs. Mike Mitchell and Le’Veon Bell talked more about a rematch in the conference title game against New England than the Jaguars, who had beaten them soundly at home earlier in the year. The Jaguars beat them again, 45-42. Never mind that both players are now gone, Mitchell signing with the Colts and Bell not signing his $14.5 million franchise tender and sitting out the season. But there is much to talk about. The Steelers are soaring. After a sluggish start, they have won five straight games, including a 52-21 victory a week ago Thursday against the Carolina Panthers when Ben Roethlisberger had a perfect quarterbacking rating for the first time in nearly 11 years. 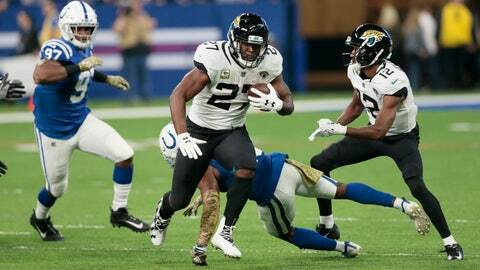 “They’re going to come in with a chip on their shoulder,” Jaguars running back Leonard Fournette said. The Jaguars more closely resemble the team that went nine straight seasons without reaching the playoffs than a team that was one quarter away from beating New England and reaching its first Super Bowl. From a 3-1 start, the Jaguars have lost five in a row. And while they still have the top-rated pass defense in the league, they looked bumbling at times last week in a 29-26 loss at Indianapolis thanks to busted coverages and confusion. Jacksonville can’t afford another loss if it wants to return to the playoffs. And it can’t afford to live in the past, whether it’s the 30-9 victory at Heinz Field last year when it intercepted Roethlisberger five times and Fournette ran for 181 yards, or the postseason win. The Steelers are favored to win, just like the last two times. No one is talking about that on either side. The Steelers no longer have the absence of Bell hanging over them. He won’t play this season after declining to sign his one-year, $14.5 million franchise tag. They’ve managed just fine with second-year running back James Conner, second in the NFL in yards from scrimmage. His 10 rushing touchdowns are more than Bell ever had in a single season. Conner’s rise put him in a bit of an awkward spot. He considers Bell a friend and wanted no part of the narrative that he and Bell would be at odds if Bell opted to return. Now that the possibility of them reuniting is out of the way, Conner feels free to just go about his business. One reason for the Jaguars’ sluggish start has been the absence of Fournette, not only a bruising runner but an explosive one. He broke off a 90-yard score last year against the Steelers in that 30-9 victory. Fournette played parts of two games this year and had 20 carries. He returned last week and rushed 24 times and caught five passes. “There no pitch count,” Fournette said, adding that his hamstring felt strong. Steelers coach Mike Tomlin says the Jaguars’ turnover margin — minus 11 — is one reason for the 3-6 start. Another was the absence of Fournette. “When you lose your feature runner, particularly one of his caliber, it affects you and it affects you in negative ways,” Tomlin said. The Jaguars are three games behind Houston in the AFC South and have lost to every team in the division, putting their playoff hopes in serious jeopardy. “We put a lot of stuff in a lot of other people’s hands,” linebacker Tevin Smith said. Quarterback Blake Bortles said Jacksonville needs a winning streak, but it has to start with one win first.